This entry was posted in General News, Research, Staff and tagged airport, cyber initiatives, Security on November 29, 2012 by Wire Eagle. AUBURN UNIVERSITY – Lt. Gen. Ron Burgess, a 38-year U.S. Army veteran who spent much of his career in the upper levels of military intelligence and security, will join Auburn University as senior counsel for national security programs, cyber programs and military affairs. His appointment begins Dec. 1. 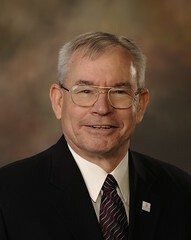 A 1974 Auburn graduate, Burgess served as director of the U.S. Defense Intelligence Agency from 2009 until July 2012, prior to his retirement from the Army in September. At Auburn he will work in coordination with the university’s Office of the Vice President for Research, providing guidance, direction and support to a broad range of interdisciplinary research initiatives. This entry was posted in Community, Events and tagged airport, terminal on September 24, 2010 by Wire Eagle. AUBURN – Auburn University administrators and local government officials say a new flight terminal at the Auburn University Regional Airport will be an important economic development tool for east Alabama. They gathered Friday afternoon to dedicate the 26,000-square-foot facility. This entry was posted in Community, Events and tagged airport on June 15, 2009 by Wire Eagle. AUBURN – The Auburn-Opelika Robert G. Pitts Airport has been an influential aspect of the community since its completion in 1930, and now, as ground is broken Thursday for a new terminal and flight line, a 20-year aspiration for further growth will finally be realized.